Your big day may be over, but you still have to complete one more task – tending to your wedding dress! Make sure that you get your dress to the cleaners as soon as possible in order to avoid permanent stains to set. 1) Always hang your wedding dress by the loops inside the gown, however, wedding gowns should not be left hanging for a long period. The weight of the dress can damage the shoulders or eventually tear the garment. 2) Storing your wedding dress in plastic bags is not a good idea. The plastic can release fumes and your wedding dress can trap moisture that cause mildew. Also any stains (ie. drinks, perspiration etc…) will change the colour of the fabric and can yellow your bridal gown. 3) Store your dress in a cool, dry place. Basements aren’t ideal for wedding dress storage because they’re damp and can encourage mold. Storing the dress where it’s exposed to heat or sunlight can cause it to turn yellow. Your best bet is to store the dress in a closet. 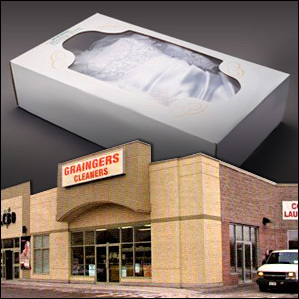 For professional bridal gown care and cleaning, come to Grainger’s Cleaners! Their staff will assist you in helping preserve your special gown for years to come. So that you can share your wedding day memories with future family members. Grainger’s Cleaners is located at 885 Lansdowne Street West in Peterborough.